Pat roast dry with paper towels. Using sharp knife, score fat layer of roast at 1 inch intervals in crosshatch pattern, being careful not to cut into meat. Season roast with salt. Wrap tightly with plastic wrap, place on rimmed baking sheet, and refrigerate for at least 6 hours or up to 1 day. Using large piece of heavy duty aluminum foil, wrap soaked chips into foil packet and cut several vent holes in top. A. FOR A CHARCOAL GRILL: open bottom vent halfway. Light large chimney starter filled with charcoal briquettes (6 quarts). When top coals are partially covered with ash, pour over one third of grill with coals steeply banked against side of grill. Place wood chip packet on coals. Set cooking grate in place, cover, and open lid vent halfway. Heat grill until hot and wood chips are smoking, about 5 minutes. B. FOR A GAS GRILL: place wood chip packet over primary burner. Turn all burners to high, cover, and heat grill until hot and wood chips are smoking, about 15 minutes. Turn primary burner to medium high and turn off other burner(s). Clean and oil cooking grate. Season roast with pepper. Place roast on grill near, but not over, coals and flames. 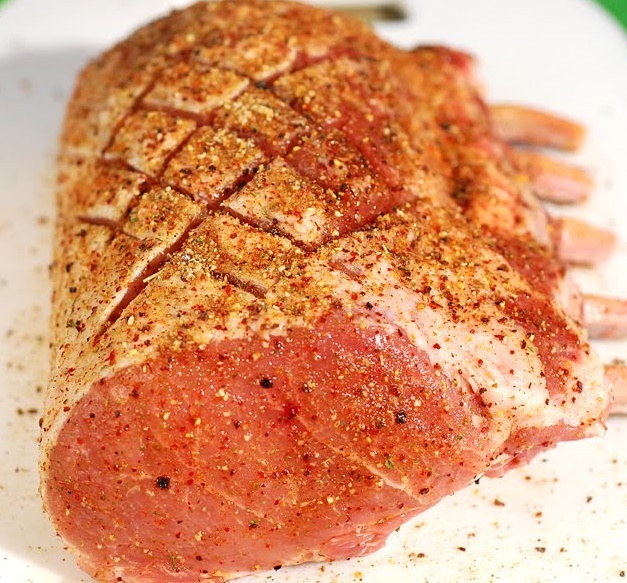 Cover (with vent over meat if using charcoal) and grill roast until meat registers 140 degrees, 1 ¼ to 1 ½ hours. Transfer roast to carving board, tent loosely with foil, and let rest for at least 30 minutes. 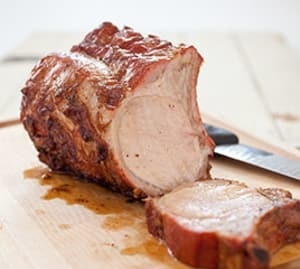 Carve roast into thick slices by cutting between ribs. Serve immediately, passing salsa separately, if using. Combine all ingredients in bowl and serve (salsa can be refrigerated in airtight container for up to 1 day) End.